These chairs are perfect. Well-made and lovely in every way. This was our first purchase from online and we are amazed at the quality and quick delivery. We have already made our second purchase, and plan on many more. We had simply worn out the original chairs which had been used daily for at least 30 years. These chairs are so pretty and are very comfortable, and match my table and existing cabinets. I couldn't be more pleased with this purchase. Very sturdy, stylish look, fantastic value chairs arrived promptly, well packaged, and without any damage. I couldn't be happier with my purchase from Atlantic Furniture. I could just as easily use them as accent chairs in my living room because they look so elegant. We use them as side chairs, but we can also use them at our dining room table. We bought them from TOV Furniture. 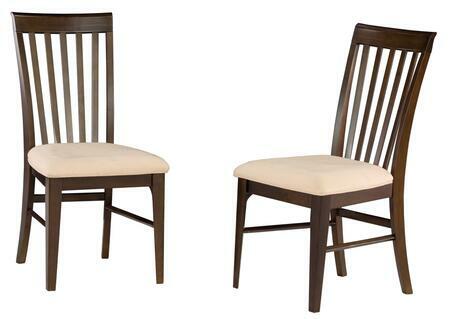 Love Atlantic Furniture dining chairs from Montreal Collection; Padding is terrific and matches wood table perfectly. The leather look will be easy to wipe clean. The wood finish goes well with our dining table and adds a raditional to contemporary feel to our dining experience. This was my first purchase from Atlantic Furniture, but it definitely will not be the last. I am greatly impressed. They are very comfortable to sit in the padding is nice and the back has a slight arch.